Happy New Year and congratulations on surviving the end of the world as we know it (nyah, nyah Mayan calendar). Hard to imagine we’re starting yet another year already; 2012 simply screamed by. Be sure to visit the HolisticInfoSec blog post for the 2012 Toolsmith Tool of the Year and vote for your favorite tool of 2012. I thought I’d start off 2013 with a bit of a departure from the norm. Herein is the first treatment of a book as a tool where the content and associated code can be utilized to perform duties specific to the information security practitioner. I can think of no better book with which to initiate this approach than TJ O’Connor’s Violent Python, A Cookbook for Hackers, Forensic Analysts, Penetration Testers, and Security Engineers. Yes, this implies that you should buy the book; trust me, it’s worth every dime of the $34. Better still, TJ has donated all his proceeds to the Wounded Warrior Project. That said, I’ll post TJ’s three scripts we’ll discuss here so as to whet your appetite. I’ve had the distinct pleasure of working with TJ as part of the SANS Technical Institute’s graduate program where we, along with Beth Binde, wrote AssessingOutbound Traffic to Uncover Advanced Persistent Threat. I’ve known some extremely bright capable information security experts in my day and I can comfortably say TJ is hands down amongst the very best of that small group. As part of his service as an officer in the U.S. Army (hooah) TJ has served as the course director for both computer exploitation and digital forensics at the US Military Academy and as an communications officer supporting tactical communications. His book maps nicely to a philosophy I embrace and incorporate in the workplace. Security monitoring, incident response (and forensics), and attack and penetration testing are the three pillars of security analytics, each feeding and contributing the others in close cooperation. As an example, capable security monitoring inevitably leads to a need for incident response, and after mitigation and remediation have ensued, penetration testing is key to validating that corrective measures were successful, which in turn helps the monitoring team assess and tune detection and alerting logic. Security analytics: the information security circle of life J. Violent Python provides readers the basis for scripts to attack network services, analyze digital artifacts, investigate network traffic for malicious activity, and data-mine social media, not to mention numerous other activities. This is a must-read book that includes a companion site with all the code discussed. Let’s take a closer look at three of these efficient and useful Python scripts. As noted above, I’ve posted the three scripts discussed in this section, along with the PCAP and PDF (malicious) discussed on my website. Email or Tweet for the zip passwords. You’ll then need to edit line 7 of geoPrint.py to read gi = pygeoip.GeoIP('/opt/GeoIP/GeoLiteCity.dat') or download the updated copy of the script I’ve posted for you. I’ve created a partially arbitrary scenario for you with which to walk through the security analytics lifecycle using Violent Python. To do so I’ll refer to what was, in 2009 an actual malicious domain, used to host shellcode for PDF-based malware attacks. I grabbed a malicious PDF sample from Contagio, an excellent sample resource. The IP address I associate with this domain is where I am taking creative liberties as the domain we’ll discuss, ax19.cn, no longer exists, and there is no record of what its IP address was when it was in use. The PCAP we’ll use here is one I edited with bittwiste to arbitrarily introduce a suspect Chinese IP address to what was originally a packet capture from a machine compromised by Win32.Banload.MC. I’ve shared this PCAP and the PDF as mentioned above so you can try the Python scripts with them for yourself. In this scenario, your analysis machine is Linux only. Just you, a Python interpreter, and a shell; no fuss, no muss. As we’re starting in the monitoring phase, imagine you have a network for which the traffic baseline is well understood. 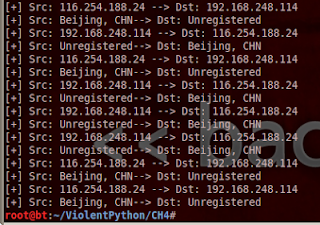 You can assert, from one particular high value VLAN, that at no time should you ever see traffic bound for China. Your netflow monitoring for that VLAN is showing far more egress traffic bound for IP space that is not on your approved list established from learned baselines. You initiate a real-time packet capture to confirm. 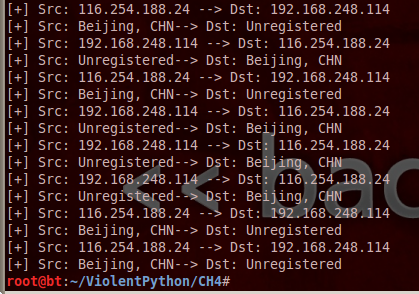 Capture (suspect.pcap) in hand, you’d like to validate that the host is indeed conversing with an IP address in China. Violent Python’s geoPrint.py script is a great place to start as it leverages the above-mentioned GeoLiteCity data from MaxMind along with the PyGeoIP library from Jennifer Ennis and dpkt. Execute python geoPrint.py -p suspect.pcap and you’ll see results as noted in Figure 1. Your internal host (RFC 1918, and thus unregistered) with IP address 192.168.248.114 is clearly conversing with 116.254.188.24 in Beijing. Uh-oh. Your team now moves into incident response mode and seizes the host in question. You interview the system’s user who indicates they received an email what the user thought was a legitimate help desk notification to read a new policy. The email had an attached PDF file which the user downloaded and opened. Your suspicions are heightened, as such you grab a copy of the PDF and head back to your analysis workstation. You’re interested to see if there is any interesting metadata in the PDF that might help further your investigation. 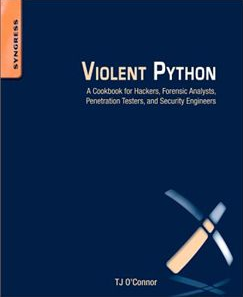 You refer to Chapter 3 of Violent Python which discusses Forensic Investigations with Python. The pdfRead.py script incorporates the PyPDF library which allows you to extract PDF document information (metadata) in addition to other capabilities. Execute python pdfRead.py -F suspect.pdf and dump the metadata as seen in Figure 2. The author reference is a standout for you; from a workstation with a browser you search “Zeon Technical Publications” and find reference to it on VirusTotal and JSunpack; these results along with a quick MD5sum hash match indicate that this PDF is clearly malicious. The JSunpack reference indicates that shellcode phones home to www.ax19.cn (see Figure 3), a domain for which you’d now like to learn more. You could have sought anonymity to conduct the above mentioned search, which lead us to the third pillar of our security analytics lifecycle. This third phase here includes web recon as discussed in Chapter 6 of Violent Python, a common step in the attack and penetration testing discipline, to see what more we can learn about this malicious domain. As we often seek anonymity during the recon phase, Violent Python allows you maintain a bit of stealth by leveraging the deprecated Google API against which a few queries a day can still be executed. The newer API requires a developer’s key which one can easily argue is not anonymous. Executing python anonGoogle.py -k 'www.ax19.cn' will return yet another validating result as seen in Figure 4. With seven rich chapters of Python goodness, TJ’s Violent Python represents a golden opportunity to expanding your security analytics horizons. There is so much to learn from here while accentuating your use of Python in your information security practice. I’m hopeful this slightly different approach to toolsmith was useful for you this month. I’m looking to shake things up a bit here in 2013 and am certainly open to suggestions you may have regarding ideas and approaches to doing so. Violent Python was a great read for me and a pleasure to put to use for both this article as well as in my personal tool box. I’m certain you’ll find this book equally useful. Russ, Great post. Ordered the book and look forward to the read. Your views and comments are well taken and thanks for all of the diligence and hard work you do to keep us all up to date. Didn't know how/where to email you about the zipped file password. So much pain at the en dof the year. The primary archive password is ViolentPython. The zipped PDF (which is absolutely live malware, play in a sandbox) is infected.